After a new injection mold is construction is finished, the mold maker need to set up the injection mold to do test or molding plastics. Setting an injection mold is more than loading and fixing the mold to injection machine, there are many other important things to do after you clamp the injection molds. This article will give you a comprehensive explain of how to setup an injection mold, and the critical checklist you should pay attention to. Setting mold height is a critical step in the setup of the new job. With this step the machine clamping force system is set to the particular mold dimension. Every brand of injection molding machine requires his own method to set the mold height, which can be found in the machine manual. During the process of mold set up the mold height is set two times. First, the initial setting, this is done during the clamping of the mold when the injection molding machine is closed to make the clamping of the mold on the fixed machine plate possible. Second, the final setting, after the mold heater/ cooling is connected and the injection mold reached the required process temperature, during the heat up or cooling of the injection mold, the mold dimension will change due to the increase or decrease of the temperature. If you set the mold height make sure the central ejector is pulled completely back. Before closing the mold select the Set-up mode, now the injection molding machine plates close the limited closing speed and clamping pressure. During closing of the injection mold make sure that that all the connection on the mold, injection mold heater and safety connections have enough slack and not wear during opening and closing of the plastic injection mold. These connections are required to bring the injection mold to the required process temperature by adding or removing energy from the mold. To achieve the process temperature a medium, water or oil is directed in circuits through the mold, one in and one out connection is called a set. If special connection schematics are required for a particular process it can be found on the molding data sheet. If no special connection schematics are required connect as much sets as possible this will increase the temperature control performance. After connecting and switching on the mold heater/ cooling the working of the heater or cooling can checked by feeling with your hand if there is an increase or decrease of temperature on all the connections that are connected to the injection mold. If the injection mold is designed with a hot runner system, there will not be a runner ejected from the injection mold during the ejection of the plastic part. The runner will remain in a melted condition in the mold to be injected in the cavity during the next cycle. To keep the plastic at the right process temperature an electric heating system is build into the injection mold and is controlled by an internal or external controlling system. Before connecting the hot runner system, make sure the connections are not damaged and free on contamination. Let the system warm up long enough before you start up the process, a cold part of plastic in the hot runner can damage or break the hot runner system. Do not let the system warm up too long, this will result in degradation of the polymer. 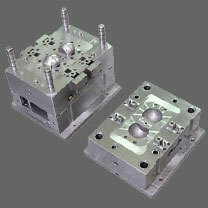 If the design of the part/ mold requires ejector pins at location where they can be damaged during mold closure if they are not in the right position, for example an injection mold mounted with slides. The mold will be fitted with an ejector safety sensor. Connect and check the ejector safety sensor during injection mold setup before you close the mold for the mold height setting. Check the working of the sensor by placing a small piece of paper between the mold plate and ejector plate, if the sensor is working correctly the injection mold will not close. If the part geometry not allows the plastic part to be ejected freely from the mold one of the possibilities is to equip the mold with retractable cores. The movement of these cores is established with the aid of pneumatic or hydraulic cylinders. The risk of mold damage by wrong operation or failing of the injection mold is high; To reduce the risk core pull molds must be equipped with position sensors, to use the core pull option the injection molding machine must be equipped with a core pull program. The parameter setting of the core pull program (positions, pressures and speed) can be found on the molding data sheet. Always connect and check the working of the core pull sensors, program and settings before you close the injection mold.